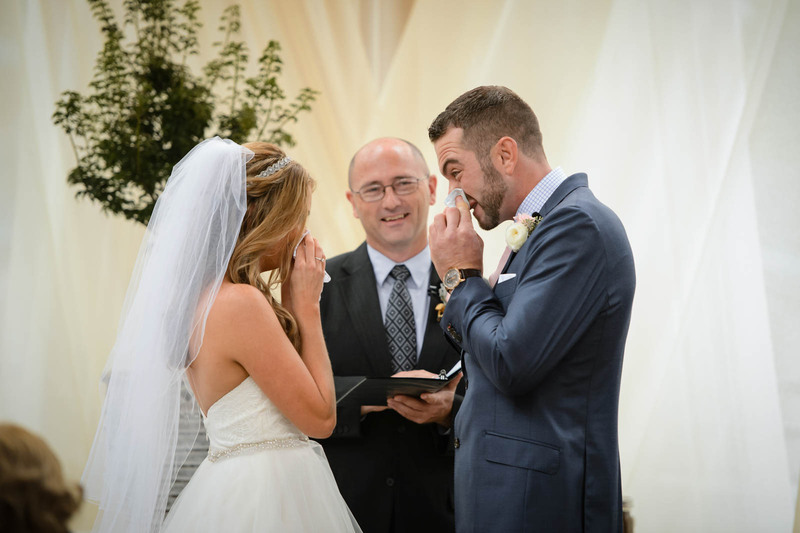 I'm glad I'm not the only one who cries at weddings. I absolutely adore Melanie and Todd, who traveled from Atlanta to Greenville for their ceremony and reception at the Wyche pavilion. And they are both such emotional people, as you can see as they wipe their noses with tissue during their wedding ceremony. Susie from Statice Floral created the stunning curtain backdrop swags that criss-cross over the brick backdrop. Despite the rain, the ceremony and reception went off without a hitch thanks to the fabulous coordination by Kristina, marketing director at Larkins on the River. The Japanese Maple tree in the background was incorporated into their wedding ceremony with a special tree planting ceremony. This has special meaning to the groom who is a horticulturist, and the couple in general who are nature lovers and avid hikers.